Last summer I was lucky enough to take my kids down to hove lawns for the paddle round the pier festival on Hove lawns in East Sussex. The summer sun shone down upon hordes of types, young and old who enjoyed two days of sea, skate, SUP and surf related run – all for charity. 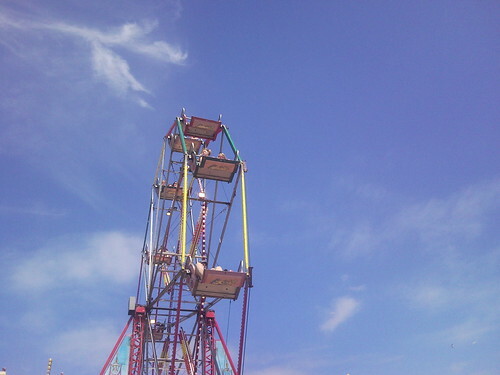 My kids loved the ferris wheel ( below ) and the adults in our party sank down on the grass with beers and listened to the music. The stalls were wild and varied with everything a wannabee surfer could wish for, food was great also. This year the 2010 festival kicks off on July the 3rd and rolls on over the weekend with a fun packed and entertaining line up of sea events ( jet ski, paddle races, SUP lessons, kite surfing ) and land events ( skate race, skate and BMX park, music, etc). For more information visit the paddleroundthepier website, then book the date as the festival grows from strength to strength each year and is a great community event for Brighton.